Concept uses a large text block for data entry, the script will parse for paragraph returns and then uses the Virtual List technique to print the multi page letter. 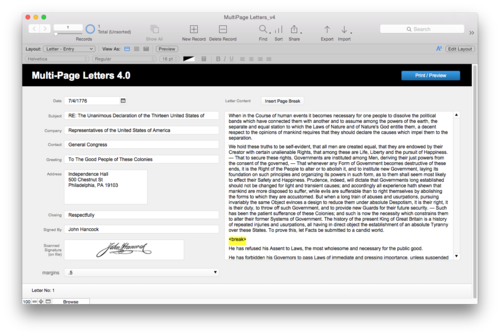 Also will allow for a scanned image of a signature to be appended and will slide up to the bottom of the body copy. Also allows for manually inserting a page break by using <break> in body of text.